Leak Insure have brought out a new sachet! The Shorty is designed to fit the smaller more compact housings; it is 20mm smaller than the Slim. 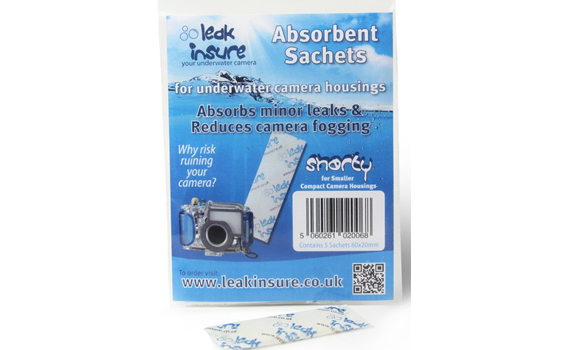 The Leak Insure absorbent sachets have been designed to absorb leaks in underwater camera housings and other underwater equipment. The sachets contain fast acting highly absorbent granules that can absorb 400 times their own weight in water. Leak Insure Sachets can buy you valuable time to get to the surface. Not only do they absorb water from leaks but they also absorb moisture from the air in your camera housing. This stops condensation forming on the walls of the housing and more importantly on the camera, lens and housing port. Leak Insure Sachets can be re-used if they are dry after the dive. 20mm x 60mm and each sachet absorbs 14ml of water. 5 sachets to a pack.